Have you ever tasted a wine with a big buttered popcorn aroma? Have you ever wondered how in the world a product made from grape juice could smell like a movie theater? It turns out that bacteria can be responsible for this aroma and many other important wine qualities. 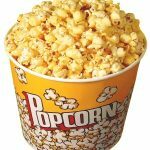 Diacetyl is responsible for the buttery smell of microwave popcorn. It's also produced in wine during malolactic fermentation. Wine cannot exist without the contributions of Saccharomyces cerevisiae, known in less scientific circles as yeast. Sure, these microorganisms convert sugars in grape juice to alcohol, but they also do much more. During fermentation, enzymes in yeast create fruity esters and liberate other trapped aroma compounds, turning plain old juice into a beverage resplendent with complex aromas and flavors. However, in many styles of wine, another important microorganism plays a key role. You may or may not have heard of Oenococcus oeni (Leuconostoc oenos if you’re old school [Dicks et al., Int. J. Syst. Bacteriol., 1995]), but chances are you have had a wine where its influence was critical. Buttery chardonnay comes to mind, as does (slightly less obviously) just about every red wine. Oenococcus is one of the key bacteria responsible for malolactic fermentation. This secondary fermentation of wine has many purposes, which I’ll outline below, including reduction in perceived acidity, change in mouthfeel, and contribution of interesting flavors and aromas to wine. Malolactic fermentation (MLF) often occurs after alcoholic (or primary) fermentation has been completed. It is caused by the growth of malolactic bacteria in wine. Most spoilage organisms are unable to grow in wine (due to factors like high ethanol content, low pH, high acidity, and low nutrient content), but malolactic bacteria can grow in these harsh conditions by feeding on the wine’s acid. Malolactic bacteria are present in the environment and MLF can occur spontaneously (just as ambient yeasts can cause spontaneous alcoholic fermentation). However, MLF can be very hard to control, and in some cases difficult to start, so modern winemakers often inoculate with commercially-prepared cultures of Oenococcus, just as many inoculate with commercial yeasts. Even when inoculated, MLF can still be troublesome and time-consuming. Depending on weather and storage conditions, for example, it may not finish until spring! Malolactic bacteria convert sharp malic acid into softer lactic acid, releasing CO2 along the way. Inset, Oenococcus oeni. You won’t find malolactic fermentation done in many Rieslings, for example, because their acidity is often the core of their structure, but you’ll often find it done in Champagne, since grapes there are harvested with very high acidity. The decrease in perceived acidity leads to a wine with a “softer” palate, altering the overall mouthfeel. Recent research indicates that the aroma contributions of MLF also go beyond diacetyl. Enzymes called glucosidases, produced by the malolactic bacteria, can free up “bound” aroma compounds trapped in wine (Ugliano et al., J. Ag. Food Chem., 2003). Many aroma compounds are found in wine in a glycosylated state (that is, stuck to a molecule of sugar). This makes normally volatile aroma-active compounds stay in the wine and out of our noses. Glycosidases effectively cut the sugar groups away from the active aroma compounds, allowing them to escape into the gas phase (the head space of the glass) and into the nose. Malolactic bacteria produce enzymes called glycosidases that free up aroma compounds bound to sugars in wine. Left, bound aroma compounds without glycosidase treatment are not volatile, so they can't be smelled. Right, glycosidases liberate aroma compounds into the headspace. Finally, MLF can lead to degradation of acetaldehyde, a wine component that is the result of the oxidation of ethanol. The grassy, nutty aroma of acetaldehyde may be welcome in oxidized wines like port or oloroso sherry, but in most wines its presence is considered a fault. In addition, acetaldehyde in wine binds very tightly to sulfites added as an antioxidant/preservative. Therefore, increased acetaldehyde content in wine requires the addition of additional sulfites. Thus, wines that undergo malolactic fermentation require the addition of smaller amounts of sulfites to achieve the same microbiological stability. Speaking of microbial stability, one reason to complete MLF in wines before bottling is to prevent it from happening after bottling. Re-fermentation in bottle can be very bad for a wine. It’s very off-putting (CO2 bubbles where they’re not supposed to be) and in some cases dangerous (exploding corks/bottles). MLF can increase microbial stability by consuming the already small amount of nutrients in wine, but it can also decrease microbial stability by raising the wine’s pH. A hot topic in the winemaking world recently is the production of biogenic amines. These compounds (e.g., histamine and tyramine) are a natural product of the fermentation process but can be harmful to sensitive individuals, resulting in headaches, redness, and other unpleasant reactions. Most commercial strains of malolactic bacteria have been selected for low biogenic amine production, but spontaneous MLF (especially if it involves Lactobacillus or Pediococcus) can result in higher production of these compounds. I hope this overview has given you an idea of what’s actually going on in wine during malolactic fermentation, why it’s used, and how the wine world would be very different without the contributions of these heroic little bacteria. -Edited by Arthur Z. Przebinda. Thank you for discussing the scientific aspects of wine and wine production. 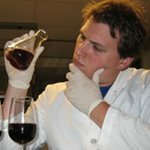 I really like your recent article at Palate Press about Malolactic Fermentation. 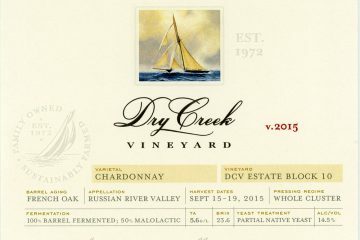 I work with customers daily who want the creamy buttery Chardonnays and want to know why it happens and ask me which Chardonnays are like that. One topic that I’m trying to learn more about is something you touched on at the end of that article about why biogenic amine production producing histamines and causes allergic reactions in some sensitive individuals. The reason is that my inner ears get clogged with fluid when I consume certain wines. I’ve been trying to figure this out for the last 10 months since it started. I am certain now that it is caused by wine and is unrelated to brand, price and varietal. I cannot predict which wines will cause this to happen. It would be great to see an article that sheds more light on the biogenics, cogeners, etc. and why they cause some individuals to react with allergy-like symptoms. Is anyone else out there experiencing ear related issues when drinking wine? One more thing I would add is that the use of citric acid to adjust acidity can cause a marked increase in diacetyl, since diacetyl is formed from pyruvate. If citric acid is added, it can be transformed to pyruvate in the TCA cycle and end up as diacetyl. This is I think the main reason, other than some “harshness” of citric acid, that it is not used any longer to adjust acidity even though it is allowed under TTB rules. See perhaps de Revel et al. J. Agric. Food Chem. 1999, 47, 4003−4008, though this phenomenon discovered earlier. You probably know this, but there is also a compelling reason not to use sorbate as a preservative when malolactic bacteria are about… geranium taint! palatepsrs.com, how do you do it? sweetening back DeChaunac and adding sorbate but still can’t keep it from starting to referment. Any ideas what to use? Appreciate any help! Thank you! People think I’m crazy when I tell them chardonnay makes me sick. The smell, the flavor turn my stomach and I get headache and nausea from the smallest glass.